While the cartoon illustrations in MazeToons are generally what sets it apart, I sometimes like to take a break from drawing figurative mazes and getting a little abstract. 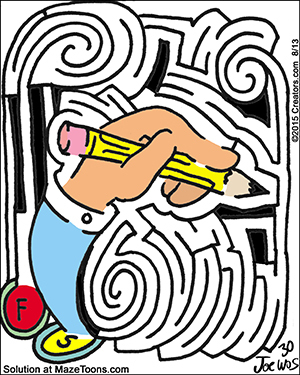 It gives me a chance to experiment with design elements, colors, illusion and depth in ways that my cartoon mazes don’t. Here is a selection of a few from the past few months. Previous Arggh! It’s talk like a pirate day! Next Too much monkey business!